I’m a big Mexican food fan so naturally when I was asked by a fellow blogger (her blog is a personal fave of mine) to do a joint post, I jumped at the opportunity. I have gone, I have tried and I loved! About five years ago when I was in New York city for work, a colleague of mine suggested that we go to an amazing Mexican restaurant near our office. Not knowing the area we were in too well, I took him up on his offer. I have never heard of Chipotle before, but I was excited to try it out the moment I set foot in the door. All of the ingredients looked fresh and the aromas were amazing. I loved that I could order a burrito in a bowl. I have to say, it was one of my favourite restaurants to eat at in New York. Yes, I just said that, but it’s true. It was love at first taste. I was sooooo excited when they finally opened their doors in Toronto and I could take my family there. To this day it’s one of our favourite restaurants when we want a special “treat”. They serve dairy products that are rBGH (Recombinant Bovine Growth Hormone) free. 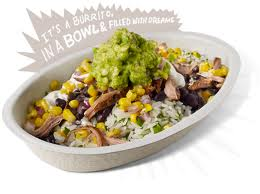 There are four Chipotle restaurants in Toronto so make it a Chipotle night or lunch with your family. And to help you achieve that, Babylish Advice and Mayahood Blog are giving away FOUR Burrito bucks (each Burrito Buck is equivalent to one free meal good for a Burrito, Burrito bowl, Salad or order of Tacos). The contest is open to GTA residents only! Enter below on Rafflecopter (it’s easy).